Today is the day of Father’s Day 2010. If you haven’t got the card for you Dad then you may be feeling that you missed the opportunity to give a nice card to your Father. There are many places to get free printable Father’s day cards online. Many websites are offering print- ready or Printable Father’s Day cards which one can simply download and print. 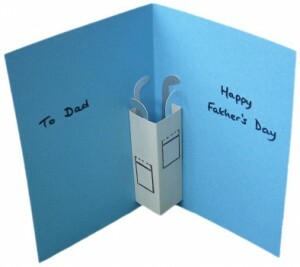 Other websites are offering the customizable Dad’s Day templates for cards. The templates are very customizable that even you can change the quotes, fonts, and colors, picture, background and everything on it. Person having good knowledge of any graphics tool including Adobe Photoshop, Paint.Net or Microsoft Publisher can change the template completely. 123printcards.com is one of the many websites offering free printable Father’s Day cards. You can use the same website for Valentine’s Day in February or on Mother’s on next May. Kids are highly encouraged to get the colorable card for website like coloring.ws. Both Dads and Moms appreciate the nice efforts their kid puts in something for them. Many websites like eCards.com are offering free eCards for Father’s Day 2010.